We renewed our Costco membership last week, and happily wandered around the store, remembering things we used to buy all the time (giant muffins! trail mix! huge boxes of Ziplocs!) and noting the new additions, primarily a number of organic selections and a refrigerated room for perishable produce. It’s amazing how much our eating habits have changed since we last shopped at Costco, before we sold our Jetta and sent Jeremy off to school: I don’t think we’ll be buying many of the prepackaged meals or frozen raviolis anymore. What we will continue heading for, though, is their meat selection, which is better by far than any of the grocery stores around Salem. On our inaugural visit, we picked up some pork tenderloins, chicken-apple sausages, a boneless leg of lamb, and a huge fillet of wild sockeye salmon. This last item was situated next to a pile of packaged farmed salmon, and despite the fact that the latter was labeled “color added,” the color difference between the two was so pronounced, I’m not sure why anyone in their right mind would choose the farmed over the wild, even for a $2/lb difference. The recipe I chose for the salmon is one I’ve made a few times before. It’s quick and easy, and always tastes great. I forgot to grab a bunch of fresh basil at the farmer’s market, so I ended up using a tube of puree instead, and it still tasted fine. My 2-pound fillet barely fit in my 9×13 casserole; I had to cut off a piece at the end and tuck it along the side. Preheat oven to 400°F. Place the first 6 ingredients in a food processor or blender, and process until smooth. Spoon 3 tablespoons pesto into bottom of 9×13 glass baking dish coated with cooking spray. Top with the salmon fillet, and spread with the remaining pesto. Bake at 400°F for 20 minutes or until fish flakes easily when tested with a fork. 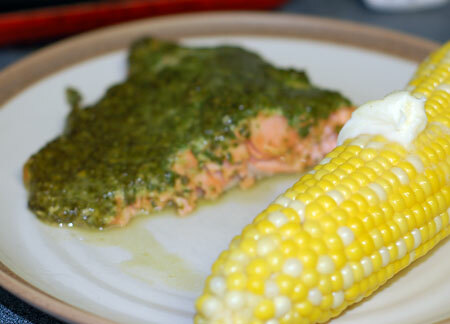 Serve with rice, quinoa or fresh corn on the cob. Source: Adapted from Cooking Light, April 2001. What an interesting pesto! This all sounds wonderful – and I love Costco!! Their meat is better than most of the stores around me, and they have a great selection of cheeses that I can’t find in my normal stores! Thanks, Deborah! It is a bit of an unusual pesto… I think the goal was to cut out all the fat, so no nuts or cheese, and hardly any oil. It comes out on the soupy side, but that’s perfect in this context. Sounds very good. Also sounds like it would be good with just regular pesto out of a jar, with a bit of spinach mixed in. Kalyn, I imagine jarred pesto would work fine, or even frozen pesto…adding in the fresh spinach would lift the color too. You might need to add a bit of broth to get the consistency, though, as this makes a rather loose pesto.